The November/December issues of Canadian Interiors magazine features a story about the work by Form: Media and Ekistics for the Delmore ‘Buddy’ Daye Learning Institute in Halifax, Nova Scotia. The Delmore “Buddy” Daye Learning Institute (DBDLI) is an Africentric-based organization that focuses on curriculum and education for learners of African ancestry in Nova Scotia. Ekistics Planning and Design and Form:Media helped to create a welcoming environment for the community, and a workplace and educational workshop and that relates directly to their African roots. From concept through construction administration, the teams developed the interior architecture, and branded environment. The core idea for the project—from architecture to signage—was based on Adinkra printing blocks, which drove most every design decision, from architecture to signage, from material to finish. Whether offices seemingly cut from large volumes, or custom symbols carved from wood blocks, the Adinkra provided the basis for all decisions. In October 2018, Ekistics Plan + Design was honoured with an award for Excellence in Planning, Physical Plans & Design, from the Atlantic Planners Institute for our work on the Argyle and Grafton Shared Streetscapes Project. The project reaffirms Argyle and Grafton as Halifax’s signature streets, on par with the city's bustling waterfront as a place that draws in residents and visitors to eat, drink and relax. As the first shared street design in Atlantic Canada, the project tested construction methods, materials, and roadway operations previously not established in the region. With a holistic planning approach, Ekistics combined placemaking and urban design with engineering and construction management expertise to shift focus away from the car, to create a people-focused public open space in the public right-of way that supports the vitality of downtown. On Friday, September 21, 2018, the Sign Association of Canada held a gala event to honour and celebrate the Canadian sign industry. The event provided an opportunity for SAC/ACE to announce the winners of their Best of Canada’s Sign Industry (BOCSI) competition. 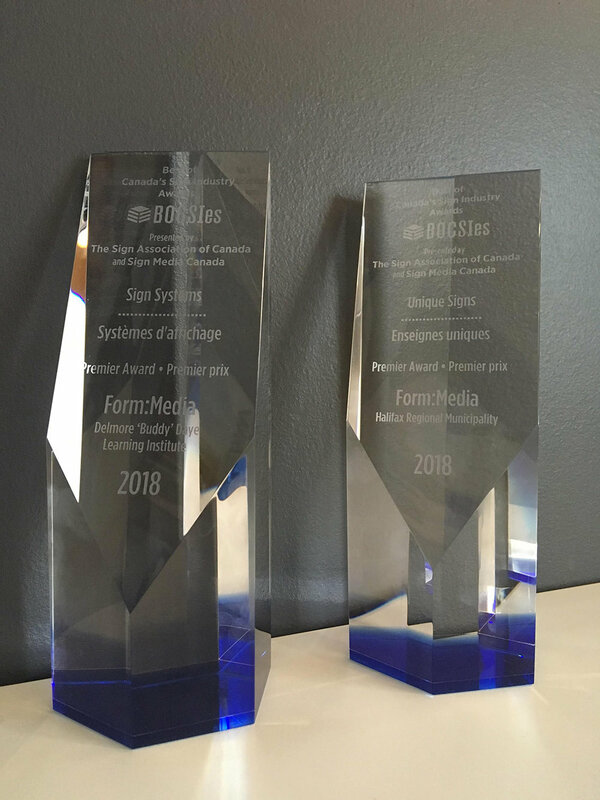 Form:Media of Halifax, Nova Scotia, Canada entered two projects, and both were recognized with BOCSIes! Their interpretive program for Fort Needham Memorial Park tied as a finalist in the Unique Signs category. A branded environment and interior signage system for the Delmore “Buddy” Daye Learning Institute was the finalist for the Sign Systems Category, and was honoured with Best in Show. Re-opened on December 6, 2017, the Fort Needham Memorial Park commemorates the 1917 Halifax Explosion. When two ships collided in the harbour, this maritime disaster generated the largest man-made explosion prior to the Atomic Age. The project entails memorial and interpretive elements to better present the Explosion story to residents and visitors, and park upgrades to prepare the site for the anniversary event. Design: Ekistcs Planning & Design and Form-Media in Consortium; sub-consultants: Elected Engineering, DesignPoint Engineering; and Light Energy Production; General Contractor: Turfmasters; Metal work: ACE Machining, and Steel Arts. The Delmore “Buddy” Daye Learning Institute (DBDLI) was founded to ensure an Africentric approach to African Nova Scotian/African Canadian education. As an Africentric-based institute that focuses on educational excellence, the DBDLI assists learners of African ancestry in Nova Scotia, identifying and addressing the gaps and educational equity issues through research, publications and educational resources. This new offices serves as a office space for staff, and a community outreach centre. 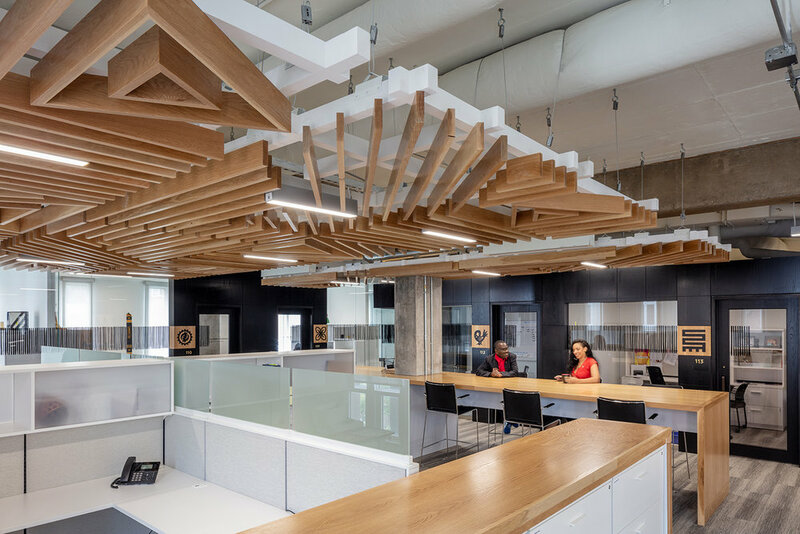 Design: Ekistics Planning & Design and Form-Media in Consortium; General Contractor: Avondale; Signage: Eye Candy Ltd.
Ekistics Architecture Co-op Student Ruth Vandergeest is featured in an article by Dal News. The July issue of Applied Arts Magazine marks Canada’s 150th anniversary with special content focussing on Canada at 150. We are honoured to have the work of Form:Media and Ekistics Plan & Design featured as a case study looking at two place branding projects that recognize and remember Canada’s past. DETAIL magazine is an issue based publication devoted to a specific constructional theme and provides a comprehensive treatment of the subject. For many professionals, DETAIL is one of the world's most influential architectural publications. Imagine our excitement when we were asked to contribute our work for Batoche to the online database. We are thrilled to announce that our work for Batoche National Historic Site has been selected as a finalist in the Experiential Graphic Design category of AZURE magazine’s 2017 AZ Awards. The project is among the 70 finalists chosen from over 800 entries arriving from 41 countries. This is an accomplishment we are most proud of. The following is a link to the People’s Choice Awards [http://azm.ag/AZPeoplesChoice]. Take a look at our work for Batoche, as well as another Nova Scotia designer, Omar Ghandi. We look forward to meeting the other finalists at the AZ Awards Gala in Toronto on Friday, June 23, at Toronto's Evergreen Brick Works. This year, Architect Massimiliano Fuksas as the 2017 AZ Awards will be the guest of honour, and will speak about his work, inspiration and process. Our architecture and landscape project at Batoche National Historic Site in Saskatchewan continues to receive attention, this time from the influential [ArchDaily] web site. Recently, AZURE Magazine wrote an article about an interactive, outdoor interpretive interpretive environment developed for Batoche National Historic Site (Parks Canada), in Saskatchewan, Canada. For Form:Media and sister company Ekistics Planning & Design, this project is an example of the seamless collaborative effort of interpretive planners, architects, landscape architects, and graphic designers working together to interpret an important cultural landscape. There have been numerous projects we have worked on for the Town of Yarmouth, Nova Scotia. In February 2016, the town launched a a new transit system, and for the past couple of year the town has been working on implementing a new wayfinding program. Rob LeBlanc, John DeWolf and Sandra Cooke have each contributed an article to the issue, which can be viewed here. To coincide with the International Mountain Biking Associations’ Take a Kid Mountain Biking Day, Parks Canada unveiled a new sign program: instructional signs aimed at teaching families how to enjoy mountain bike trails, and a new interpretive program that highlights the rich natural and cultural heritage of the area. Earlier in 2016, Form:Media was awarded a contract to design and deliver a mobile kiosk for Cape Breton Highland National Park. Needless to say, the team is immensely excited about this project. Our Branded Environment team including Chris Crawford, Julien Boudreau, and John deWolf worked on this project. When we heard that neighbourhood kids were crowing around the fence during construction, we knew we had designed a hit playground, but now that it is open, our latest project is turning planespotters into frequent fliers.